After hearing from both Sen. Claire McCaskill (D., Mo.) 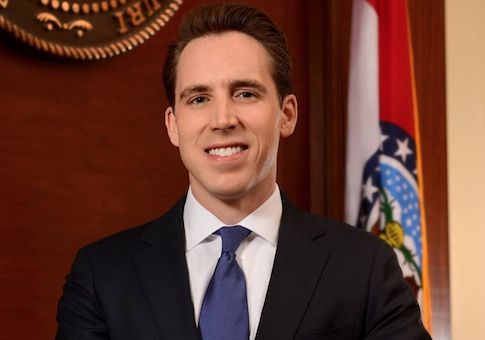 and her Republican opponent Josh Hawley on Friday, the Missouri Farm Bureau decided to endorse Hawley, citing its bad relationship with McCaskill. The Farm Bureau falling into Hawley's column was not a given—in 2016 it gave its gubernatorial endorsement to Democrat Chris Koster—but it came out of the event calling McCaskill's defeat an "extraordinarily important" goal for the organization. "We have to win this election," said bureau president Blake Hurst, who went on to slam McCaskill for her unwillingness to work with Farm Bureau members. "You heard from both candidates, one thing that probably wasn't mentioned that should have been is the working relationship we have with our current senator, and it is not good," Hurst said after awarding Hawley the endorsement. "We need a person we can talk to in office, we need a person who will return our phone calls." "We've got a lot of work to do between now and November, and we're excited about this endorsement," Hurst said. Hawley, who won the endorsement with support from 93 percent of its trustees, told reporters after the event that McCaskill had "declared war" on the state's farmers. "It's an incredible honor to have your endorsement, and it's an incredible honor to get to go speak for you," Hawley said in his remarks after receiving the endorsement. "From now until November, I'll be speaking for you, speaking for what we believe in , and our way of life." "I know how hard you work every day, and I pledge to work just as hard. I'll be out there every day taking the fight to my opponent and taking the fight to our opposition." Hawley also said he views agriculture as the "pride of our state." "Agriculture is the pride of our state and the heart of our way of life. Missouri farmers not only feed our people, they power our economy and feed the world," Hawley said. "Our farmers deserve a senator who will fight for them, who will support them and our way of life, not the big money special interests. And that’s exactly what I intend to do." Hurst, in addition to slamming McCaskill, praised the dedication Hawley has exhibited towards the farming community. "Josh Hawley has continuously proven his leadership and dedication to the people of Missouri by taking on ‘the big and the powerful,’ but even better, he has proven he is dedicated to protecting our farms and family businesses," Hurst said. "He has earned the endorsement of our PAC trustees. He is a proven leader and will be a tremendous addition to the U.S. Senate." This entry was posted in Politics and tagged 2018 Election, Claire McCaskill, Josh Hawley. Bookmark the permalink.